Steve Jobs once said, “Most people make the mistake of thinking design is what it looks like. It’s not what it looks like and feels like. The design is how it works.” A growing number of people want to turn their houses into unique places that will bring joy to their hearts and will be pleasing to the eye. The list below is a compilation of design ideas that combine both: a stunning appearance and a practical approach. We at Bright Side collected some unusual design ideas from the internet and are excited to share them with you. Look at these photos if you want to feel inspired to change your house and to boost your creativity. 1. Surprise your guests with unique and terrifying swimming pool tiles. 2. Cheer your kids up with a fun slide instead of a boring staircase. 3. Take relaxation to another level with these hammock floors. 4. Add some color to your hall with a stained glass door. 5. Surround yourself with books by storing them under the bed. 6. Make your room magical with wall murals. 7. Relax in a squishy ball lounger. 8. Bring stars right into your room. 10. Liven up your room with creative chandeliers made with cups and bottles. 11. Watch the fish swim around while washing your hands. 12. Observe the starry sky every night with this glow-in-the-dark wallpaper. 13. Bring nature inside your bathroom with a vertical garden. 14. Set an office pod in your garden to always be productive. 15. Hide your car with this hideaway car elevator. 16. Make your kitchen special with an unusually-shaped sink. 17. Feel like you are sleeping on a cloud with a bed that’s suspended in midair. 18. Use all the space productively with staircase drawers. 19. Combine a coffee table and a carpet in a unique design. 20. 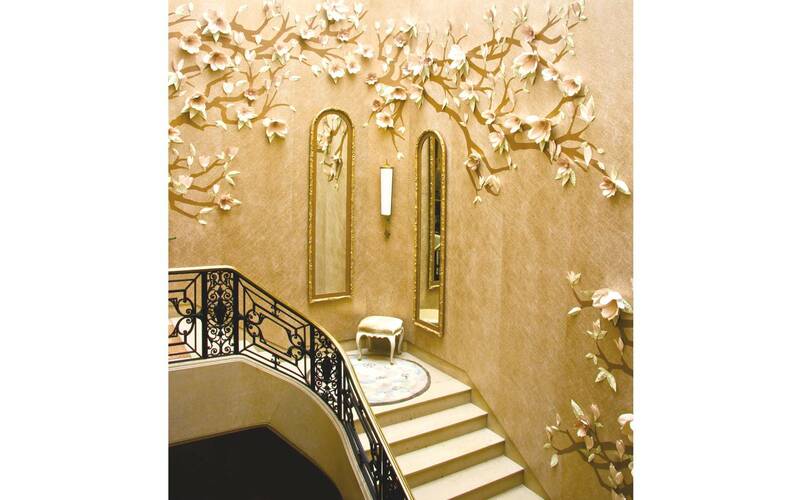 Put some paper flowers on the wall to turn your house into a castle. Would you like to incorporate any of these ideas into your own home? Which idea inspired you the most? Share your opinions and impressions in the comments!